Can be purchased with 95 Emblems of Frost. 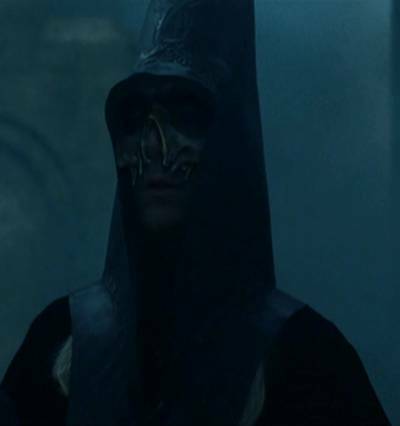 I hate to say it but it looks like Lucius Malfoy's Death Eater Hood from Harry Potter and the Goblet of Fire. This helm is going to look awesome on goblin warlocks.It will make them look like Night Goblin Shamans from Warhammer`s goblins.Now all you need is some madcap mushrooms. The T10 helm is wicked. Much better than the T9 helm and their identical caster counterparts. to me it is adorable. kind of makes me want to cuddle and hug them until their head pops off! *squeeee* ! I was lucky and got the legs and hands from VOA... I know the legs are the least desirable of the tier pieces given the amazing crafted legs, however, they are easily attained and my initial goal is "get the 4pc bonus" as it was for many people. I bought chest for 95 (great stats) and then was left with choice of helm or shoulders. I have the ilvl 245 badge helm with hit and haste, T9.25 helm, and the Nemesis Skullcap from Ony25. My choice was to go for the shoulders and diss the helm for now... The Ony Helm has more base spell power (150 v 140), 99 spirit (a fair chunk of spell power with raid buffs, around 40sp) and Ony helm also has a red gem + meta, which is nice. Just a consideration if anyone else wondering where to spend. To be completely honest, it looks like the hood members of the racist Ku Klux Klan wears, due to it's pointed style. Although I'm pretty sure Warlocks aren't Klansmen, just evil. Looks ridiculous on worgens with all that hair out the back.